The EA is based on the breakout of the important support and resistance levels. The robot has the ability to gather data and to calculate the values of the floating spread as a percentage for all the operation period. 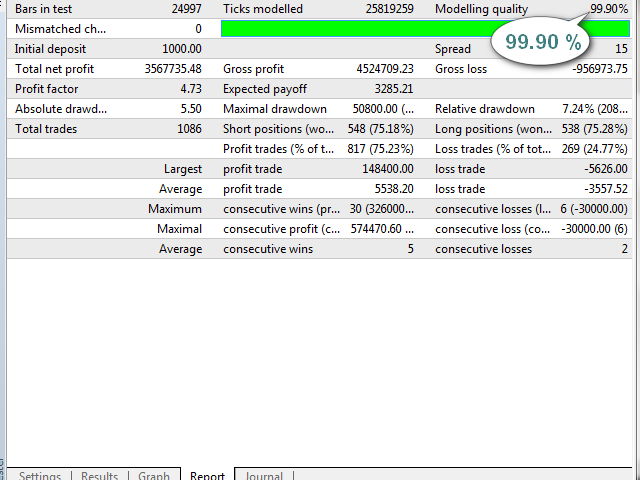 With this program the brokers will be unable to mislead you on the change range of the spread of any currency pair. Everything will be recorded and calculated. So far I have never seen a script, an indicator or an EA with this capability. This is one of my latest developments, and I am sure this feature will be very useful to you. The operation is performed on two currency pairs - EURUSD and GBPUSD. There is also a possibility to include another currency pair, but that task requires certain knowledge. Currently, the best results with the default settings of the EA can be achieved on the two mentioned pairs, and I suggest you stick to those unless you have the proper experience. Following is a number of similar parameters that refer to the other two strategies. During the optimization tick only the indicator variables that refer to the optimized strategy. Attention: Make sure to comply with the currency pairs and timeframe requirements.